It’s certainly cold enough right now in Burgundy to feel very Christmassy, with frost on the fields around us this morning. Lucky for us, the sun is shining too, so we are enjoying that blissful time of year when it’s cold but crisp and clear. To help get ourselves into the Christmas mood, we’ll be heading to the opening of our local Christmas Market in Sens on Saturday, 3 December. Twinkling lights, delicious smells of cooking food, vin chaud and hot chocolate. Heavenly! Sens Christmas Market is held right in front of the impressive St Etienne Cathedral, regarded as the first of the great Gothic cathedrals of France. 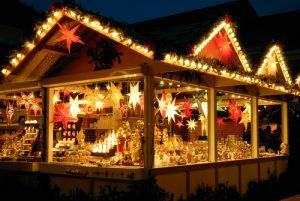 At the foot of the cathedral there will be wooden chalets selling Christmas fair, along with carol singers, musicians, jugglers and magicians. You can visit Sens Cathedral almost any day of the year from 8.00 am to 6.00 pm, and take one of the audio tours if you are interested in its history. Pick up a map and/or audio guide (in English) at the Office de Tourisme in Sens. Choose from an audio tour that focuses solely on the cathedral, or one that takes in all the historical and architectural highlights of Sens. Take a fantastic 360-degree tour of Sens Cathedral here. Be sure to swoop up to the inside of the roof, but remember to hold on… it’s a long way up!